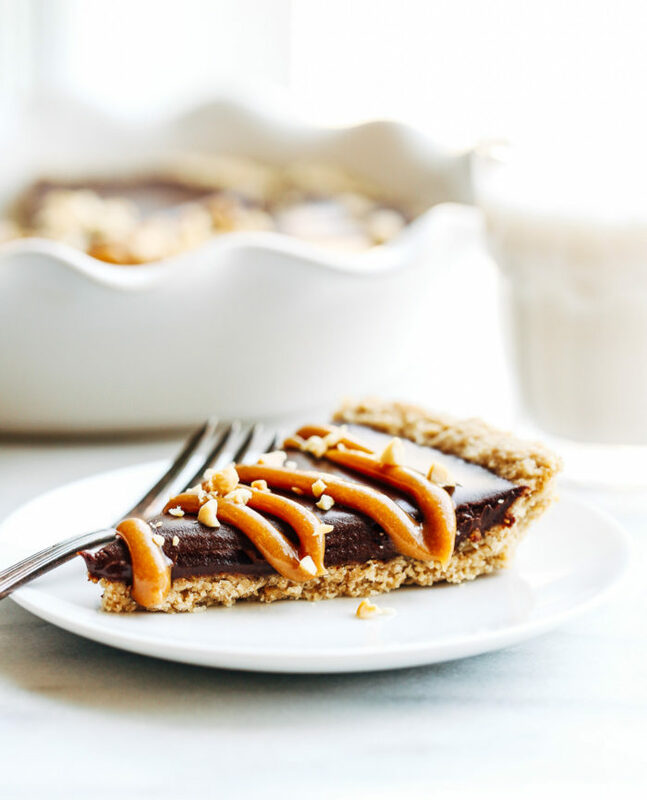 Peanut Butter Lover’s Chocolate Tart- a silky chocolate peanut butter dessert that everyone will love! Made without dairy, gluten, soy, or refined sugar. I celebrated my 32nd birthday yesterday. It sounds so weird to say that I’m 32. Where did the time go? The good news is that, most of the time, I still feel like I’m 22 and I like to think my eating habits have a lot to do with that. That was about the age they started to drastically improve, right after I graduated college and found myself with more time to cook. Reading blogs quickly became a source of inspiration for me and, like many other bloggers out there, one of the first that I discovered was Oh She Glows. I remember reading an article about her Green Monster experience in a magazine and being instantly intrigued. Since then I’ve followed Angela’s journey overcoming an eating disorder, giving birth to a healthy little girl (with another one on the way! ), and writing two beautiful cookbooks. I look up to her in so many ways and am thankful for all that she’s done to improve the lives of others through healthy food. 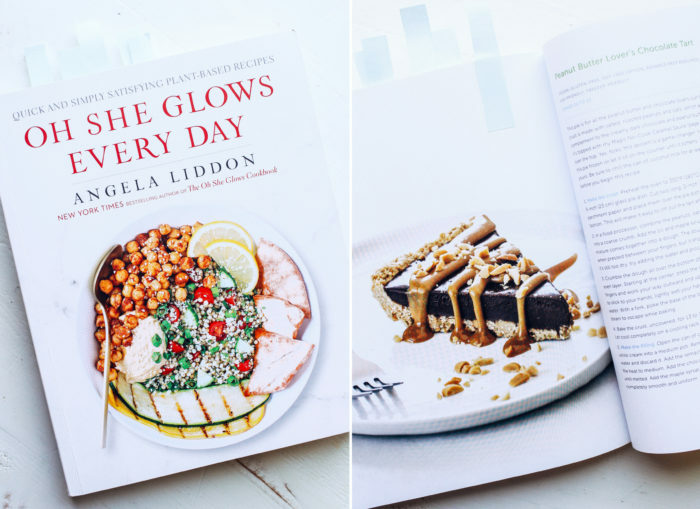 It’s sincerely an honor for me to share a recipe with you today from her newest cookbook, Oh She Glows Everyday. Angela has mastered the art of creating fool-proof recipes that everyone will rave about. I’ve never made a single one that hasn’t turned out amazing. 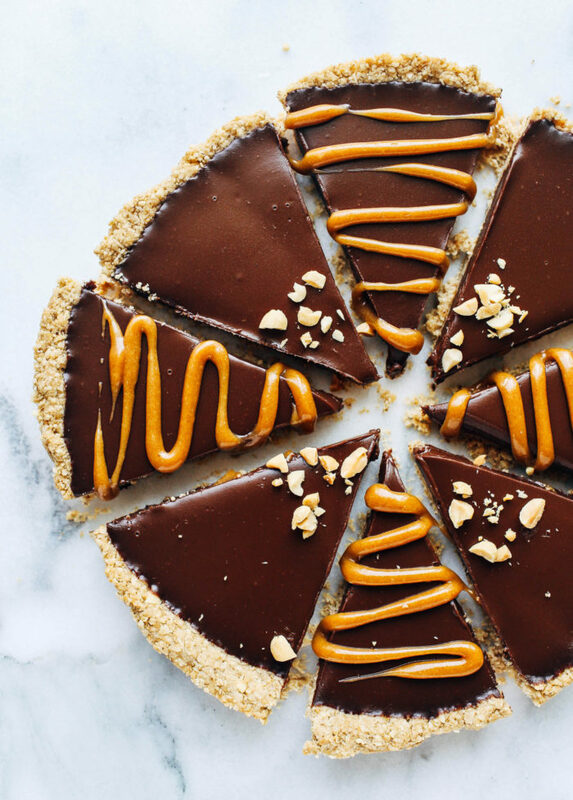 It was challenging to pick just one to share with you guys, but as soon as I laid eyes on this chocolate peanut butter tart (which Ashley did a magnificent job photographing), I knew that was it. 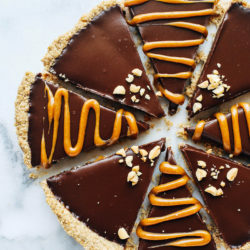 From the salty roasted peanut crust to the silky chocolate peanut butter filling and the magic caramel sauce on top, it is mind-blowing delicious. Brandon let out a few curse words after taking his first bite and then ate three pieces the following day. I’d call that a true testament to how incredible it is. There’s no doubt I’ll be making it again. Although next time I think I’ll probably bring it to share with family and friends so that we don’t end-up eating so much in one sitting. Here’s a few recipes from the book that are on my list to try next! I honestly can’t recommend her new book enough. It’s sure to become a staple in your kitchen and I know you will love it as much as I do. Prepare the crust: Preheat the oven to 350°F. Lightly grease a 9-inch pie dish. Cut two long, 2-inch wide strips of parchment paper and place them over the pie dish in a crisscross fashion. This will make the tart easier to remove after freezing. 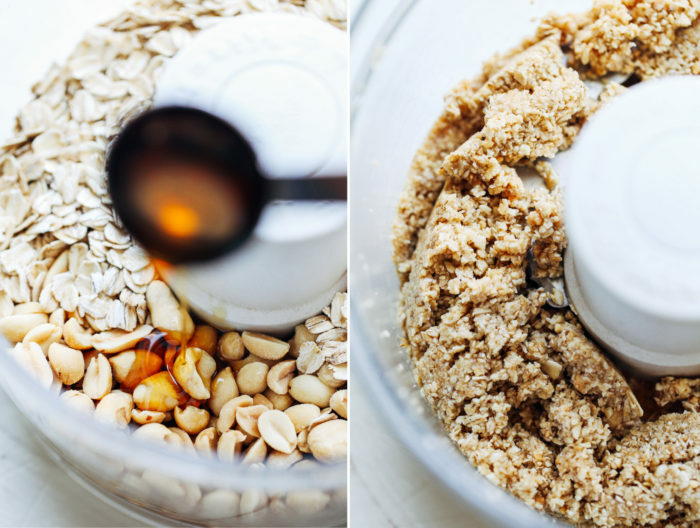 In a food processor, combine the peanuts, oats, and salt then process to a coarse crumb. Add the coconut oil and maple strip then process until a dough forms. The mixture should stick together when pressed between your fingers, but it shouldn’t be really sticky. If it’s too dry, try adding a small splash of water and process again. Transfer the dough to the pie dish and spread out in an even layer. Starting at the center, press the dough into the pan with your fingers and work your way outward and up the sides. If the dough begins sticking to your hands, lightly wet your hands and shake off excess water. Using a fork, poke the base of the crust seven or eight times to allow steam to escape while baking. Bake in the oven uncovered for 13-17 minutes, until light golden brown. Allow to cool completely. Prepare the filling: In a small pot, scoop out the solidified portions of the can of coconut milk. Discard 1/3 cup of the coconut water from the can then add the remaining portions to the pot. Turn the heat to medium, add chocolate and cook, stirring occasionally, until melted. Add the maple syrup, peanut butter, and salt then whisk until smooth. Pour the filling into the cooled crust then carefully transfer to a flat spot in your freezer. Allow to set for 4-6 hours, until solid. If you want to freeze it for longer, cover with foil after filling has firmed. Prior to serving, let the tart sit on the counter for five minutes. 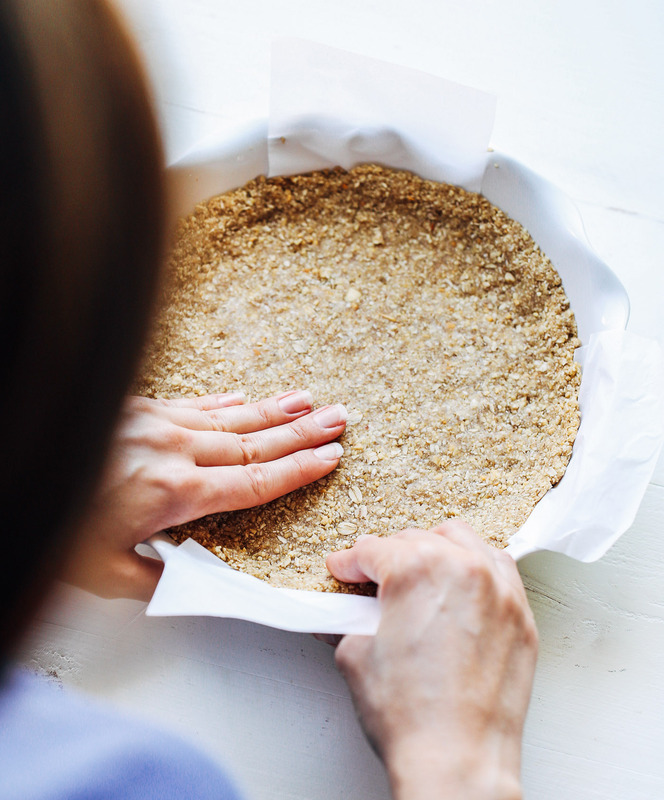 Using the parchment paper, carefully lift the tart out of the dish. 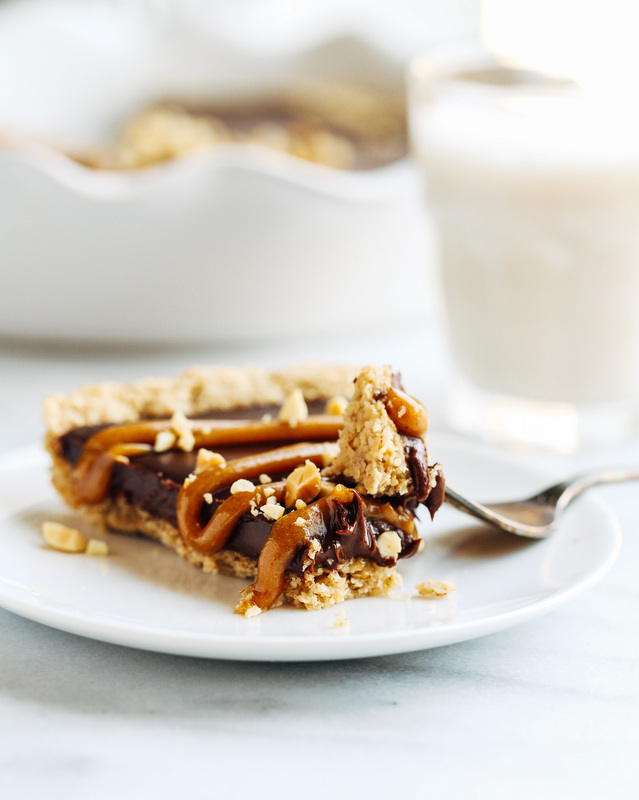 Slice the tart then serve with peanut butter caramel sauce and chopped peanuts. 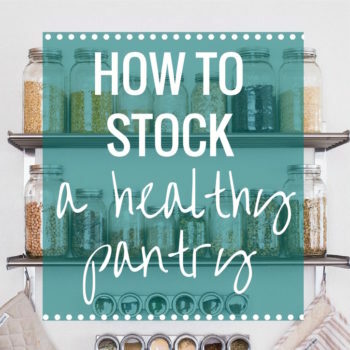 Store leftover slices individually wrapped in foil then placed in an airtight container in the fridge for up to 5 days, or in the freezer for 4-6 weeks. *For the Peanut Butter Caramel Sauce: In a food processor, combine 1/3 cup virgin coconut oil, 1/2 cup pure maple syrup, 1/4 cup creamy natural peanut butter, 2 tablespoons raw coconut nectar and 1/2 teaspoon salt. Blend until smooth. Transfer mixture to a jar, seal, and refrigerate for 1 hour. To pipe the sauce, transfer it to a plastic baggie and cut off the corner. Gently squeeze over the pie. Leftovers can be stored in the refrigerator for up to 2 weeks. 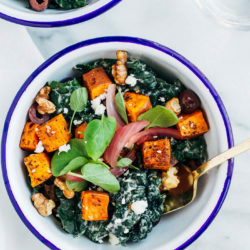 Recipe from Oh She Glows Everyday by Angela Liddon. Copyright © 2016, Glo Bakery Corporation. Reprinted with permission from Avery Books, a member of Penguin Group (USA) LLC, A Penguin Random House Company. A mega happy birthday again, m’dear! I saw your bday dinner on InstaG and was so jelly…you all have such amazing restaurants in the bay! 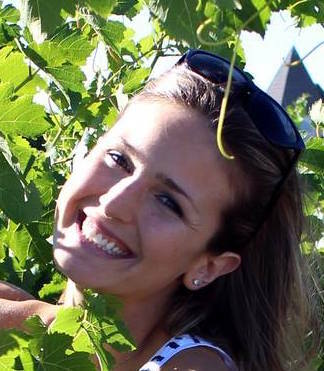 Cheers to 32 and to taking great care of yourself…you look 22, as a result! I’d probably make the six vegetable and “cheese” soup. I love dairy alternatives. This pie looks pretty darn good, too! I hope 32 is a great year for you!! All of the recipes sound fantastic but I would really like to try the 6 vegetable and “cheese” soup! I would definitely want to try the Meyer Lemon Cheesecake with Strawberry-Vanilla Compote….I am a HUGE cheesecake fan and something about lemon desserts have always been a huge weakness of mine. Thanks for sharing! I would love to see (and make of course) the Chocolate-Dipped Vanilla Bean Macaroons! Anything coconut is my favorite. Or if you have any recipes that are cheesy, without nutritional yeast. Not sure why, but something doesn’t agree with me when eating it right away. Happy Birthday!!! ✨ That lentil stew sounds amazing and perfect for the coming cooler months!! Happy birthday! 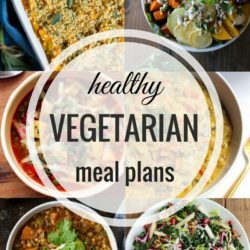 I want to try all the recipes. Do you think this would still be good if I substituted all the peanuts for almonds? This dessert looks amazing!!!! Happy Belated Birthday!! I am trying to transition into a Vegan diet so Oh She Glows has been a go-to for recipes! I love eggplant so I would love to try the eggplant parm! Thanks for all your wonderful and yummy posts! I would love to make the 6 vegetable and “cheese” soup. That sounds so comforting right now as the weather changes to fall. Thanks! Happy belated birthday! They all sound great, with Flourless Peanut Butter cookies on the top of my list. The recipe looks great, but high five to you on the killer photos — birthday girl!! Happy Birthday! If this is in the book, then I want to try it so bad. It looks so good. Yummy! I love OSGs and this tart looks delish. All her recipes are foolproof! Intrigued by the endurance crackers! This looks unreal. I’m chocolate all the way, so I think I’d make (and eat!) this tart and then move on to the ultimate flourless brownies. I have been on a quest for a vegan version and I am willing to bet that Angela has cracked the code! I want to try all of them! (Is that not the right answer? Ok, I’ll pick the lentil stew, since that’s probably what I’ll try first.) Love Oh She Glows! I hope you had a wonderful birthday Sarah, and you’re just a baby really. :) You look fantastic — keep up the good work! I am just blown away by this tart — by how delicious it looks and by your photos! This is my kind of dessert and I can’t wait to try it. I need to get my hands on that book, and the first things I would make besides this tart would be the Eggplant Parmesan and Chocolate-Dipped Vanilla Bean Macaroons! Happy belated Birthday wishes to you! Your recipe pictures are beautiful, as usual. And, I think the Endurance Crackers sound intriguing. Thanks for giving us a chance to win the cookbook. That tart looks divine! It has my husband’s name all over it! All of the other recipes you listed sound right up my alley as well, but if I had to pick one, the Golden French Lentil Soup caught my attention first. Thanks for the chance to win this awesome cookbook! 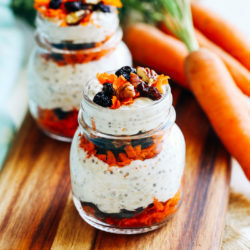 I am always looking for different snack recipes so the endurance crackers sound right up my alley! I’d love to try the 6 vegetable and “cheese” soup, give tomorrow will officially start fall and the weather will cool off. Would the endurance crackers make a good accoutrement? If so I vote for those two recipies. Thank you for giving away her book, I’ve followed her blog for years and also find it inspiring. Happy Birthday! Oh and thanks for the tart recipe, definitely on my list to make! I would love to try the Ultimate Flourless Brownies! Sounds delightful! Oh wow, my hubs will LOOOVE this tart! Happy Birthday, and keep feeling younger than the number you are! I would love to try the lentil stew and/or the macaroons. That cookbook might just have to go on my wish list if another reader wins it. take care. is all of them an acceptable response? if not the lentil stew. Omg!! They all sound so good but I am a sucker for dessert . I would definitely have to go with The Ultimate Flourless Brownies or The Flourless Peanut Butter Cookies. Help…I can’t decide!!!! Plus a happy happy birthday to you! I got her book in the mail earlier this month and I am SO excited to make this recipe! 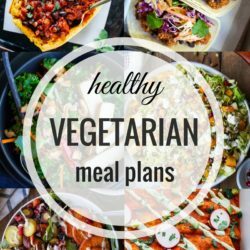 I had a cooking day with one of my friends last weekend and we made the curried chickpea salad, stuffed avocado salad, and secret ingredient chocolate pudding – all were amazing! The Ultimate Flourless Brownies sound amazing! Ahhhh, happy birthday friend! I’m only a few months behind you to 32! Hope you had an awesome day. Those recipes all sound amazing, but I’m especially a fan of eggplant parm. So good! I’d like to try the Golden French Lentil Stew. Happy happy Birthday Sarah!! Hope this year is fabulous for you! :) The Meyer Lemon Cheesecake sounds amazing!! I have her first book and just love everything she does. Very curious about the endurance crackers! Veggie & Cheese soup sounds good too. I would love to try making the ultimate flourless brownies for my mom, since she has a gluten intolerance making baked goods for her used to be really tricky. 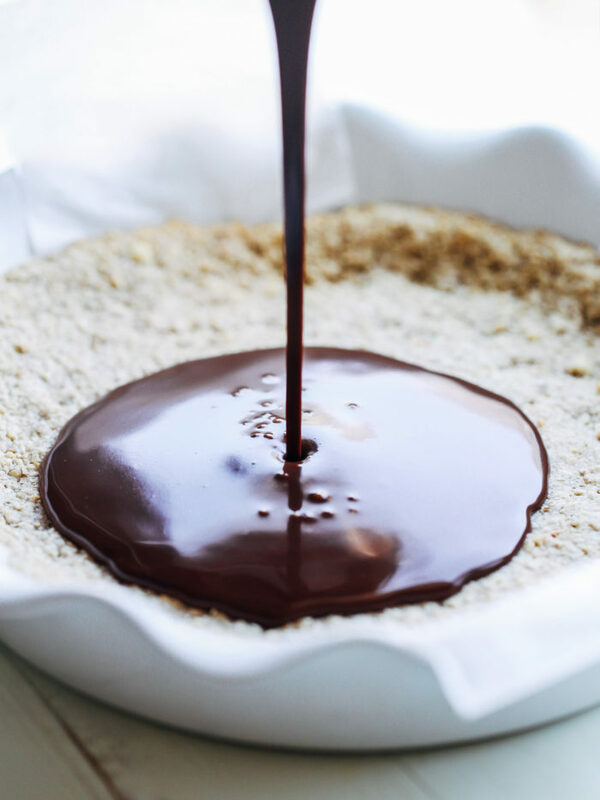 In the meantime I’m going to take a crack at making this drool worthy tart! That looks absolutely delicious. I love the variety that she is showcasing- yes! I would really love to try the Chocolate-Dipped Vanilla Bean Macaroons.. right up my alley! Happy birthday! The lentil stew would be just perfect for fall in our house! 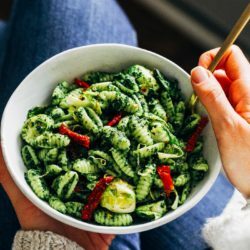 Oh She Glows is one of my go-to sites for food the whole family loves. I’d love to try this tart or the Flourless Peanut Butter Cookies! Perfect for my SO, who is a PB fiend! This tart looks SO good, I need to try making it ASAP! Like you, I am a longtime fan of Oh She Glows & have definitely been inspired by Angela. I’d love to check out her book! The veggie and cheese soup is what I’d love to try! 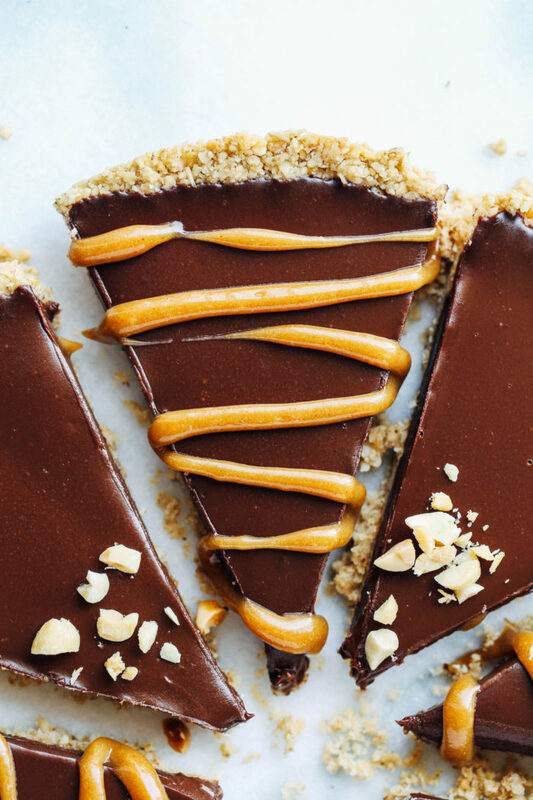 Oh man I cannot wait to try that chocolate peanut butter tart! Would love to try the eggplant parmesan! I’d love to try that rainbow quinoa salad! Yum! Yum! Would love to try the vegetable and cheese soup! I’m absolutely going to try and make the Meyer lemon cheesecake. I would love to try the Ultimate Flourless brownies! I want to try the Meyer Lemon Cheesecake!! I’d like to try the Meyer Lemon Cheesecake, my oldest son has begun a lifelong love for cheesecake…Finally! He requested one for his birthday and I was doing back flips, cheesecake is one of my favorite desserts! Chocolate-Dipped Vanilla Bean Macaroons sounds really amazing! I’d like to try the “Endurance Crackers”; I love food that goes “crunch” and if it provides me with endurance then all the better!!!! i think the 6 Vegetable and “Cheese” Soup would be interesting! I would love to try the brownies! Hope you had a great birthday! I would love to try to make the Chocolate-Dipped Vanilla Bean Macaroons. They sound amazing! Would love to try those macaroons! I will love to try the Meyer Lemon Cheesecake with Strawberry-Vanilla Compote!! Made this to accompany the vegan hot chocolate at a dinner party. It was the most incredible desert ever! I’m so glad it was a hit! Thanks Jemma! My sister is vegan but I’m not. We recently had a cooking day and we chose this as the dessert. HOLY MOLY it is the most delicious thing I have ever tasted. I’ve always been a fan of vegan desserts, but this one is my favourite by far! I plan on making it again this weekend cause the one piece I got last time was not enough! Isn’t it incredible?! Angela’s books are full of stellar recipes! This is my go to recipe for a dessert – everyone at work didn’t even know it was dairy free, gluten free. Don’t make unless you are sharing as you will absolutely eat the whole thing yourself! !